Kerry Motor Club is pleased to announce that the launch of the 2016 Autosolo Championship as part of its continued drive to encourage new competitors into Motorsport. This will be the 12th year of the competition showing the interest in this new branch of Motorsport at Club level continues to grow, as it enables competitors to use standard, road going cars with minimal preparation, whilst still remaining highly competitive and is therefore a natural lead for new competitors into other branches of the Sport. Autosolo tests differ from that of the more familiar Autotesting type in that, all test are forward motion only (no reversing) and tests are constructed to promote the forward motion of a vehicle. The 2016 Championship will be decided on a competitor’s best 3 scores out of the 4 counting rounds of the Championship. The Competition will be open to all holders of Motorsport Ireland driver’s licence and to the holders of RAC MSA driver’s licence of a grade no lower than Clubman B, except junior licence holders. Competitors must be in possession of a 2016 competition licence from Motorsport Ireland or have purchased a one day licence from the Clerk of the Course for this event. Competitors can purchase a one day licence on the day of the event, but they must have booked it with the Clerk of the Course prior to the event.  Contact details of the event Clerk of the Course will be posted on the Kerry Motor Club Website & Autosolo Facebook Page prior to the event. The championship is open to all individuals over the age of 16 years. Signature of Parent or Guardian is mandatory (if driver is under 18 years). Competitors, who do not hold a current Road Traffic Licence, may compete provided that the event organisers are satisfied that they (the competitor), provide the necessary experience and competence to compete in such an event. All competitors must abide by the 2016 Motorsport Ireland competition rule book and by the published regulations for each event. All competitors must only compete in the car which they have entered the competition in. A change to another car is not permitted during the competition unless cleared by the Clerk of the Course for this event, and the substituted car must be in the same or a lower class category. Entries Not to Exceed 30 Competitors. (1) Each Competition shall be decided on the best performance in a series of test run during the event. 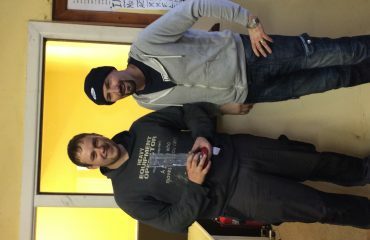 (2) Awards: 1st overall on each day. Additional awards may be presented at the discretion of the Organising Committee. (3) 1st, 2nd and 3rd in all classes will be presented as part of the KMC Autosolo Championship at end of season. There will be 4 Championship Rounds, competitors need to start a minimum of 2 rounds to qualify for the Championship, with 3 rounds counting towards overall scores. The minimum number of test run must be 8 with a recommendation of 10 or 12. 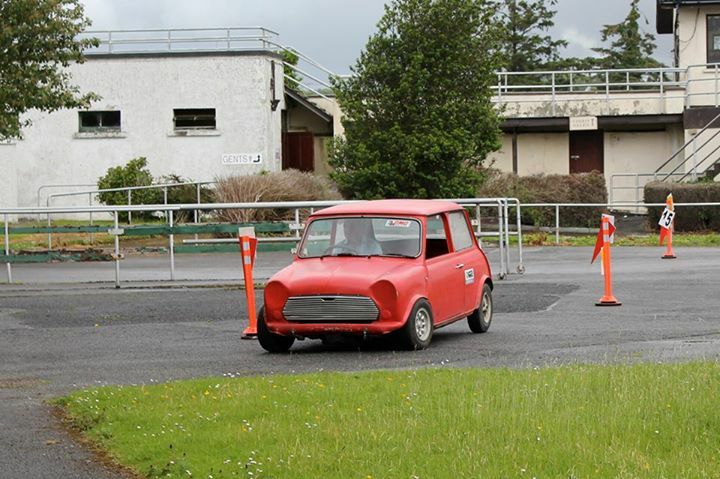 Each test site must be properly prepared and be manned by marshals prior to the arrival of the first competitor. No test should be duration of less than 30 seconds, with a recommended average of 40 to 50 seconds. Tests must be of the open type, designed as far as possible to equate the performance of cars of different sizes. Tests will be run as per diagram set out by the Clerk of the Course. Competitors will not be allowed to set out tests unless requested and under the supervision of the C.O.C., whose word is final. Once the first competitor has attempted a test, no alteration may be made to the test instructions. Numbered cones of a minimum height of 3 feet bearing an arrow to indicate course direction mark the Course. You pass the cones in ascending order to the left or right of the cone as indicated by the attached arrow. The use of bright yellow cones may be used to indicate the route. In the interest of safety, no test may be started and finished on the same line. Two lines side by side may be used. (5) Tests will be timed in seconds and tenths of seconds. Penalties in seconds will be added to those times and the competitor with the lowest aggregate in each event will be the winner of that event, with other competitors being placed in order of their total times. Ties will be decided by the better time (including penalties, if any) on test 1, failing that test 2 and so on until the tie is resolved. (6) Each test will have a flying start, with two lines laid out approx 3 feet apart. Timing will begin when the car’s front wheels cross the second line. wheels cross the line. Stopping with either rear wheels past the line will incur a line fault, as well as putting only one wheel across the line. (8) A penalty of 5 seconds shall be incurred for a line fault or for each initial contact with a cone, which is in the correct position. Where a car touches a cone, it is then replaced in its correct position and if touched by the car later in the test, the driver should be penalised a second time. But if the cone is out of position when touched a second time only the first penalty can be applied. It is recommended all spots where cones are placed should be marked on the ground so that marshals know exactly where to place them if they are moved. (9) A driver who receives any outside physical assistance during a test shall be deemed to have incurred a fail on that test. (10) The maximum penalty on a test, including failure, shall be the best correct performance in class on that test plus 20 seconds. To ensure a consistent interpretation of a fail on a test, the following will apply: Where a driver has made a mistake he is allowed to correct himself but if he continues after passing on the wrong side of a cone he has then incurred a fail. (11) The only judges of fact of a particular test will be the marshals appointed for the test. (12) Notification of any penalties incurred by a driver on a test must be made available to him immediately on completion of the test. This is to prevent the possible incorrect allocation of penalties in cases where a car is being driven by more than one driver. (14) General Competition Rules, once a driver has started an event in a car, he may not change to another car without getting permission from the clerk of the course and the replacement car must be in the same or lower class. (15) If a competitor fails to start in the allocated running order due to mechanical fault or otherwise he may be reseeded to the back of the field but he must attempt the test no later than 10 minutes after the previous competitors finish time. (16) In the case of any dispute arising during the course of an event, a competitor may appeal to Motorsport Ireland against a decision of the organisers providing this is lodged with Motorsport Ireland within 48 hours of notification by the organisers of the decision in dispute (G.C.R. 173-178). (17) In order to maximise safety and keep speed to a minimum, the lay out of the Course will ensure a change in direction at intervals of no greater than 50 Meters. All cars with a non-standard differential will have their time at the end of the competition multiplied by 10%. The decision to apply a handicap will be taken by the Clerk of the Course for the event. (19)All cars must be normally aspirated, 2wd and be no greater than 2000cc. (20) No racing tyres (tyres marked-for competition use only) allowed. (21) Acceptance of External Modifications to competing cars differing from original Manufacturers Specification will be at the discretion of the COC. Cars must be presented in a safe condition and any competitor advised by the COC to alter or make improvements will be required to have carried out these changes by the next round. Failure to do so will lead to exclusion. (22) Silencers must be fitted where required. These cars must have a solid roof fixture in place whilst in competition. (26) All competing cars windscreens must be of laminated glass. (27) Prior to the removal of any side and/or rear glass competitors must consult with the Clerk of the Course. (28) To facilitate the organisers of the event, competitors will not be permitted to progress to a test without handing up the previous time card at Event Office to allow for the updating of results / penalties awarded where applicable. Time Cards not signed including entrants competition numbers will not be accepted, therefore the competitor will not appear on final results. 1st group will be competing on the course; the 2nd group will be getting ready to Compete and the 3rd group will be marshalling on the course. Alternatively if the COC deems to have sufficient marshals, competitors will be nominated to assist in the set up / collection / clean up of tests locations. In the event of any of the above dates be rearranged, registered championship competitors will be notified and alternative arrangements posted on the Kerry Motor Club website & Facebook Page.The points system for the 2016 Kerry Motor Club Autosolo Championship is calculated on the following basis:The Championship will be class based.The Overall Points Category:The competitor with the highest number of points will be the Overall Winner.Points are awarded on the following basis; the winner of each round of the championship gets 25 points. 2nd overall in each round gets 24 points, all the way down to the 25th competitor overall who gets 1 point. All subsequent finishers in each event will also get 1 point.The Class Points Table of the 2015 Championship will be decided as follows:The competitor with the highest number of points in each class will be the class winner. Points are awarded on the following basis: the winner of each class in each round of the 2015 Championship will be awarded 10 points. The 2nd placed competitor in each class will be awarded 9 points and so on down to the 10th finisher in each class who will get 1 point. All subsequent finishers in the class in all rounds of the championship will also be awarded 1 point.In the event of there being a tie for any award the following adjudication will apply:The competitor with the greater number of wins will be deemed the winner. If it cannot be solved then it will go to the greater number of 2nd places and so on until a winner emerges. If this does not solve the tie it will go to the competitor whose highest placed finish had the greater number of finishers, finishing lower than the forenamed competitor.AWARDS:OVERALL CHAMPIONSHIP: —- 1st, 2nd, 3rd. CLASS: —- 1st, 2nd, 3rd.Additional awards may be presented at the discretion of the Organising Committee.ANY COMPETITOR WHO WINS AN OVERALL, WILL NOT BE ELIGIBLE FOR A CLASS AWARD. 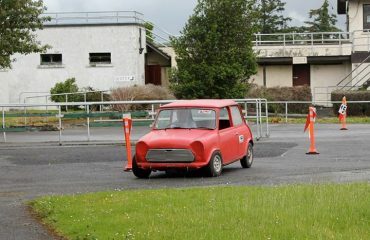 COMPETITOR CAN ONLY CLAIM ONE AWARD.Registration Fee for the Kerry Motor Club / TradeKit Autosolo Championship is €10. Competitors must register prior to competing in their 1st round of the Championship. All Competing cars will be required to any carry Championship decals if asked to do so.